This standout is the pride of Pannekoek Orchideeën. It is a truly unique flower in our extraordinary assortment. This Phalaenopsis orchid is known for its many small flowers, hanging branches (that grow how and where they want) and graceful leaves. The orchid’s strong branches prevent it from needing a reinforcing stick. And once the orchid is in bloom, its many flowers (over 50) can make it resemble a colourful bouquet. 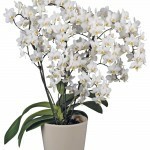 The Jungle Orchid is a real “eye catcher” wherever it is placed, and is certain to add an uplifting element to any room. For more information about Jungle Orchid make sure to check out the FloraPlanet web page.